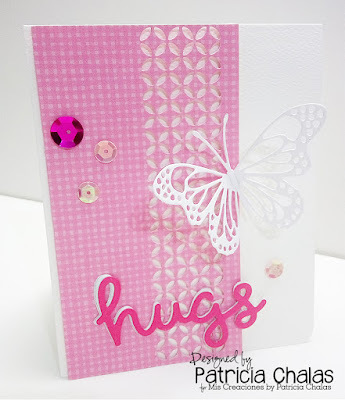 Hello, Patricia here to share a cute Hugs card with you today! This cute card is going away with a birthday present for a friend of my friend. I hope that she likes it as much as I did and so my friend. My card is 4.5"x5.5 white base, next, I cut a piece dotted pink designer paper and die cut it using my FAV Piestra Tile die cut from Memory Box then I made a sandwich to die cut using pink cardstock and white foam to add the raise effect to my Hugs sentiment from Lawn Fawn die cut . I wanted to give the soft and pretty feeling to the card and die cut my lovely Lunette Butterfly from Memory Box using white cardstock. And to accent the whole card I added some bright & light pink sequins. visit our Dies R Us Challenge Blog too! Beautiful card! Love that background die and that big bold beautiful butterfly! WOW! Perfect way to set that HUGS die too! Love it! You definitely achieved soft and pretty on this card, Patricia! I love that cut side panel and the beautiful butterfly! So pretty!! Beautifully done, love the soft pink and pretty butterfly! 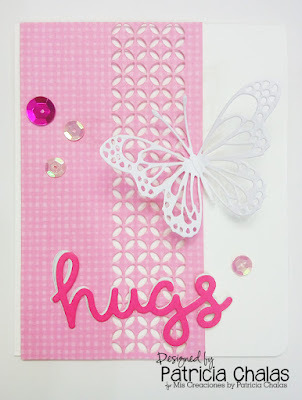 Really like the combination of pinks on this card and that hugs die. Beautiful card Patricia, I too love using the Piestra tile die. Love the butterfly and the sentiment. Wonderfully done Patricia. Love the colors you chose and the butterfly. Love everything about this card. Such a lovely idea. May have to create one of my own. THank you girls for your lovely commemts! !